As a travel writer and photographer, I spend endless days on the road and in airports. I incessantly pack, unpack and repack. I eat too much service station grub: previously taut body parts now either wibble or wobble. My socks smell. The rest of my time, it seems, is spent at border posts, dealing with officious officials or sweet-talking police with questionable ethics. Life on the African road isn’t all rolling savannas, game-filled plains and long desert tracks to 'nowhereville'. Yet the last six months – even by these standards – have been an exhausting and exhilarating period of exploration. I’ve bedded down in some cockroach-infested hellholes and have bush-camped in Namibia’s -5 degree deserts (before being chased away by German farmers with guns). 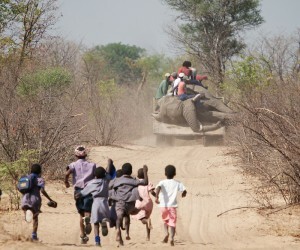 But most of my time has been spent working on a film about Zimbabwe’s giant elephant problem. For 10 months of the year, Hwange National Park is home to one of the world’s most incredible wildlife spectacles. Yet every year, a manmade resource is having a catastrophic effect on the animals and habitat, as thousands of malnourished and thirsty elephants struggle through the harsh summer months. Myriad factors, including prolonged periods of drought and human encroachment, are bringing the national park to crisis point. The catalyst can be traced back some 70 years, when Hwange’s founder Ted Davison first introduced artificial water supplies. 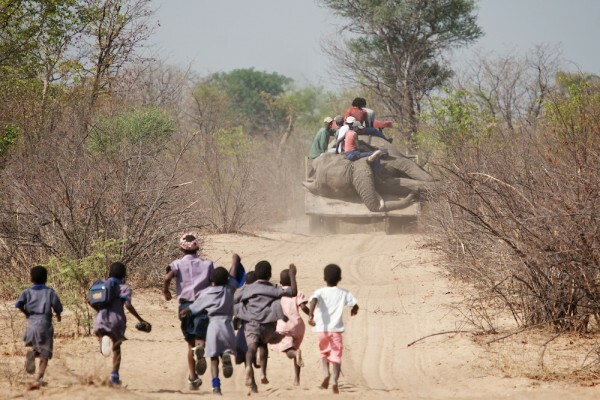 Davison had watched the park’s modest elephant population migrating during the summer months – each year they came into conflict with man and returned in smaller numbers. He wanted to offer the animals a suitable and safe habitat so they didn’t need to leave, while enabling the park’s tourism to thrive. It worked: the elephants stayed, their numbers escalated and lodges began to open. Despite Davison’s good intentions, Hwange was to be altered in ways that no one could have envisaged. Elephant populations quickly doubled and continued to grow steadily at around 5% per year. Their 300 kilogrammes per day diet began to impact on the environment, particularly during the dry season (from September to November). Thirty years later the results have been devastating, and as we approach 2013, the park finds itself facing an impossible predicament. I have recently returned from Zimbabwe with the Ecomentaries film crew, our new company that specialises in ‘green’ productions (www.ecomentaries.org). The team, including my other half and producer Gemma Catlin, filmmaker Chris Scarffe and editor Werner Kruse, were in Hwange to investigate the current situation. No amount of research could have prepared us for the hundreds of starving elephants we witnessed pushing and shoving around the arid pans. Their skin sagging loosely over their hungry bodies, ribs jutting out from impossibly thin torsos and sunken skulls wrinkled with dehydration. I can still hear their distressed bellows as they fought for space at overcrowded waterholes. Not all made it: the air was full with the stench of decay and lives wasted. We spent three weeks searching for some answers. We questioned, listened and learnt. But every scientist, vet, local community member and tour operator articulated the problem, and therefore the solution, in a slightly different way. We followed the struggles of one operator, Imvelo (www.imvelosafarilodges.com) who, at great cost, pumps more water than any individual in the park. Owner Mark Butcher believes that maintaining the artificial situation is merely a short-term band-aid. However, he cannot simply sit back and watch the animals die while the battle for a long-term solution continues. “I have inherited this problem and cannot bring myself to stop the supply, despite it not being the answer. Simply turning the water off would be catastrophic for Hwange,” said Butcher. Van Aarde is an advocate of ‘rezoning’. He claims that opening up migration corridors and enabling elephants to move easily between suitable habitats during the dry months is the answer. This would minimise their interaction with humans (as he says elephants do not like being around people). Yet what of the communities that would have to uproot for these migratory paths, not to mention the cost and logistics involved? The more people to whom we spoke, the more multifaceted the scenario became. For every well thought-out solution, a string of stumbling blocks remain. Throughout the film we listen to the experts and examine all the proposed solutions: from culling to contraception; translocation to ‘nature’ taking its course. The issue is unarguably a convoluted and complex one, surrounded by question marks and opinions. Grey Matters will offer an in-depth and impartial examination of one of Africa’s most pertinent wildlife issues.